The Hawaii VA Foundation is pleased to announce the final disbursements of funds to the 2014 Hawaii VA Foundation Grant Recipients Pūkoʻa Kani ʻĀina and Valley of Rainbows! 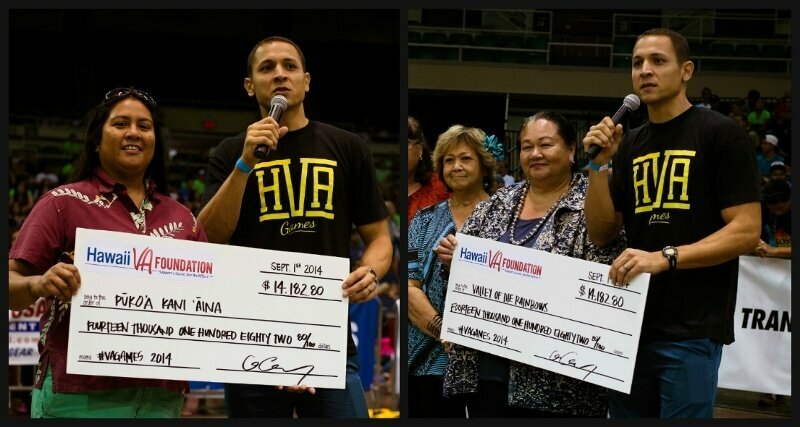 In the summer of 2014, the Hawaii VA Foundation announced the selection of two local non-profit organizations that would receive a portion of the $35,457 raised through the 2014 Hawaii VA Games: Pūkoʻa Kani ʻĀina and Valley of Rainbows. Many may recall that after awarding each non-profit with $14,182.80 (40% of the funds) at the end of the VA Games, the Hawaii VA Foundation planned to track the progress of each organization and then have the public vote on which group would receive the remaining 20% or $7,091.40 toward their programs. Over the past several months, HVF followed each group, and what they saw, inspired them. Therefore, there will be no public voting to see which group receives all of the remaining funds. As you will see by watching each organization’s video below, both Pūkoʻa Kani ʻĀina and Valley of Rainbows deserve more funds to put toward the implementation of their worthwhile and beneficial programs. Both organizations happily agreed to the split and received a remaining $3,545.70 each! “Pūkoʻa was very honored to have won this grant and appreciate the push it took to fulfill our part of the agreement. Mahalo nunui!” ʻEkela Kahuanui said. In total, each non-profit received $17,728.50 courtesy of the Hawaii VA Foundation. “We’re thankful for this award and partnership with Hawaii VA Foundation! We were able to accomplish so much and outreach to many youth in our community, thanks to your generous donation,” said Denice Keliikoa of Valley of Rainbows. Now, watch their project videos below and feel the good vibes brought to you by the inspiring work of Pūkoʻa Kani ʻĀina and Valley of Rainbows! Using ancient Hawaiian cultural practices as the primary inclusive tool, Pūkoʻa Kani ʻĀina engages in activities with the primary goals of strengthening families and encouraging increased engagement with physical education, health, fitness, and honest competition. Since 1999, Valley of Rainbows has implemented programs and provided financial assistance to support the educational, athletic, and cultural pursuits of Wai’anae Coast youth, ages eight to 17.